A shining leaf above the thousand seeds grown wild. Unlike the spooky Halloween traditions that glorify death and dying, Dia de los Muertos is a celebration of life. On display in the dimly lit upstairs auditorium at the Grand Rapids Public Library (GRPL), were approximately 20 altars with brightly colored ofrendas (offerings) to the dead. The auditorium offered a place of reverence and reflection to observe the displays and talk with artists on site. This first annual exhibition, sponsored by the GRPL and GRPL Foundation, was made possible by a grant given to the Hispanic Heritage Committee of the GRPL. Many of the organizers took part in creating the shrines, and fans of the GRPL, were encouraged through Facebook to participate in this year’s exhibition. 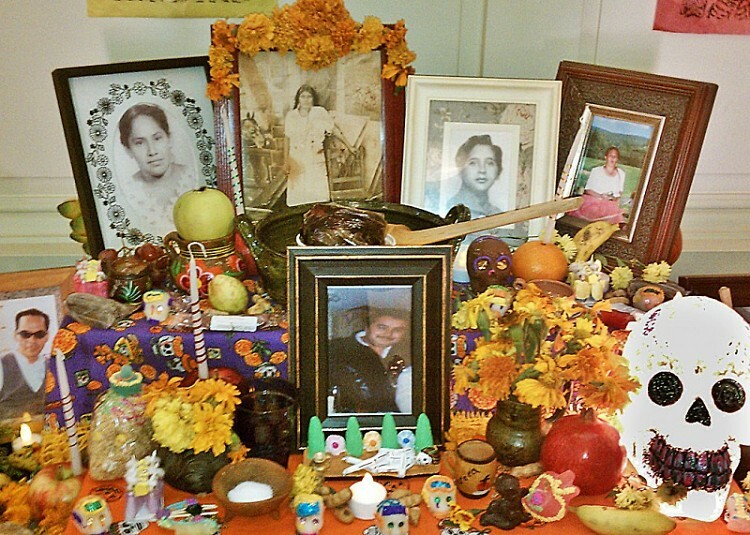 While deeply rooted in pre-Aztec civilizations, this unique ritual remains widely celebrated in Mexico, and is a traditional holiday of current modern Mexican and Latino cultures in the United States. The holiday, now merged with the Catholic observance of All Saints’ Day on Nov. 1 and All Soul’s Day on Nov. 2, still maintains some Aztec ritual, such as the use of skulls who honor the dead. There are many resources for background information on the Dia de los Muertos history, culture and traditions, including Internet web sites and books at the GRPL. Katherine Thelen, a Texan native, created an altar honoring her mother, Doris Morrison. Thelen has studied Hispanic culture and was familiar with the Dia de los Muertos celebration. She explains that altars usually contain traditional elements in an effort to do one of three things: to honor, to offer relief, and to teach children not to be afraid of death. 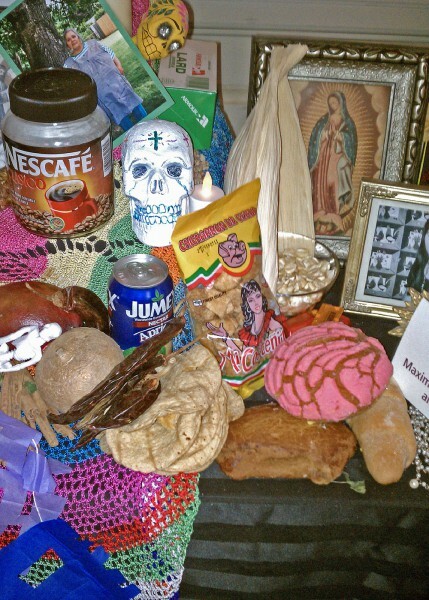 For this reason, the use of candy and painted skulls on the altars teach that we are not supposed to be sad for those who have passed, but happy that they have moved on to a better place. Celebrants may offer grooming items, perfumes, flowers, food and beverages because it is believed that spirits cannot enjoy these things after death. As well, salt is given to flavor and incense and scented candles are burned. Gathering these items allow you to reflect on what the person who has passed liked and what would best represent them in life (and death), causing you to revisit thoughts and memories of that person. Thelen found the process cathartic. Creating and sharing her altar with others, she passes along stories that remind her of her mother. She honored Morrison’s spirit with meaningful items arranged against an animal print backdrop, which represented her outgoing personality. Offerings included: photographs of Morrison with family; a picture of Elvis; a can of Dr. Pepper; a bottle of her favorite perfume; jewelry, much-loved dolls; oranges, limes, and lemons; and a paper tissue yellow rose (for the yellow rose of Texas). For some, creating an altar to those whose lives were cut too short, offers a powerful opportunity for healing and closure. Sarah and Luke McGee honor their father who passed away one week after turning 31, when Luke was five years old. He writes, “I only have child memories of him. Little moments frozen from a child’s perspective. But, I know many things about him. I know he loved my sister and I very much.” One altar created by a family whose son committed suicide at age 16, and another in remembrance and support of survivors of domestic violence, offer a way to bring to the forefront societal injustices, such as bullying and domestic abuse. As one participant notes, “Being part of this Dia de los Muertos celebration has been a powerful way to honor and celebrate my father.” Truly, it was a powerful and moving exhibit to witness. Visually stunning and brilliantly colored, the exhibit allows for creative expression while honoring those who were loved and now missed. With plans to continue this event next year, committee organizers may want to take a closer look at space and presentation, maximizing the amount of space available to those who might want to participate. This year’s exhibition also offered related programming in theater, myth and stories combined with opportunities for children to create sugar skulls. Handouts on how to “Make Your Own Sugar Skulls” and “Make Your Own Altar” were also made available to visitors to the exhibit. Expanded programming offers the opportunity to educate visitors to the exhibit about the traditions and culture from which it came. To get involved in next year’s exhibition send email to: [email protected], in care of the Hispanic Heritage Committee with the Grand Rapids Public Library. Moved by my visit to the Dia de los Muertos exhibition, I decided to use the information I had gathered and learned to create a shrine of my own. 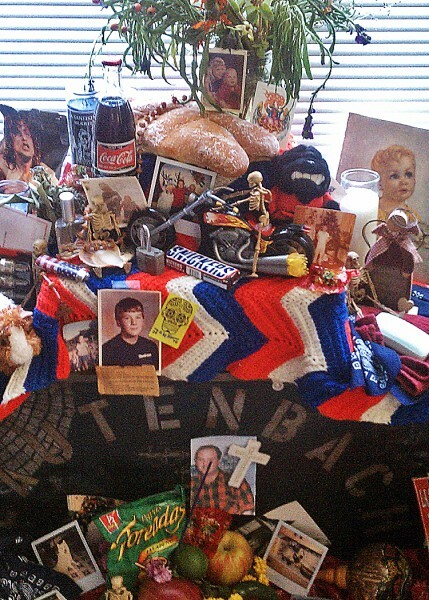 I asked my mother to participate in the creation of an altar, in honor of my deceased brother, Douglas John Lautenbach (July 18, 1969 – March 24, 1999). Doug died in a tragic car accident that ended his life before the age of 30. While a life wrought with turmoil, including time spent in prison, reflecting on the positives of his life through the altar creation offered comfort and a sense of peace. On Sunday, Oct. 31, My mother and I gathered the things that best represented Doug in the form of photographs, flowers, toys, candy, food, handkerchiefs and candles. I located a small dusty box carrying the remainder of his belongings in the basement of our family home. Many of the personal items and photographs excavated from the old dusty basement box had served as visual memoirs to Doug while in his prison cell. A musty red, white and blue afghan, the only one that my great aunt had crocheted for us as children, spoke of the continuity of life and death. As I browsed the contents of the box, I was brought closer to a sense of joy and peace in the chosen items, which best represented the most positive parts of Doug’s short existence. A quick trip to local La Vencedor Mexican Bakery and Grocery store provided us with pan de los muertos (bread of the dead), fruits, candies,and trinkets that paid respect to the Mexican culture in which this ritual originated. Bags of chips and Snickers bars served as reminders of treats purchased in the prison vending machines during visiting hours. We gathered these items at the base of a large black metal chest, that at one time held all his possessions. A cell mate had carved into it with a sharp tool to create intricate exposed metal line drawings of dragons, the name “LAUTENBACH” and the numbers ”189210” (his prison number while incarcerated). Gathered amongst dried purple and yellow flowers from my mother’s garden and offerings of fruits and colorful chili peppers, were arranged old Polaroids of beloved family pets, also long since passed. A new toy, purchased as a gift and reminder of his passion for motorcycles, served as a centerpiece surrounded by calacas (whimsical skeleton figures that represent death), stuffed animals, and a cut-out wooden angel, the last gift he had given my mother before his untimely death. While working collaboratively we found spiritual commonalities that transcended religious doctrine. With differing religious practices, my mother and I were able to cross a delicate boundary in the use of symbolism and definitions of worship and reverence. Brought together by the stories we shared of him and the memories that made us smile, I was able to revisit a part of my brother’s life that at one time had brought great pain. It was in these moments that we were able to step aside and see him for the son and brother he was in life - a troubled young adult who longed to be a better father than what he’d had and a tender lover of children and animals. While Doug had been adopted at a young age, he was my brother. When hearing the early morning news of his death, I was compelled to create a drawing of him holding a puppy, from a favorite photograph. My mother now took down the framed drawing from the wall and placed it at the altar’s base. From my mother’s armoire, I pulled a tattered and yellowed newspaper clipping of the following poem to add next to a photograph of Doug as a child. In the light of his memory, we lit candles each night after its creation, honoring his presence in our lives and the absence he has created in our hearts since.